Order a dozen red roses upgraded with white dendrobium orchids. 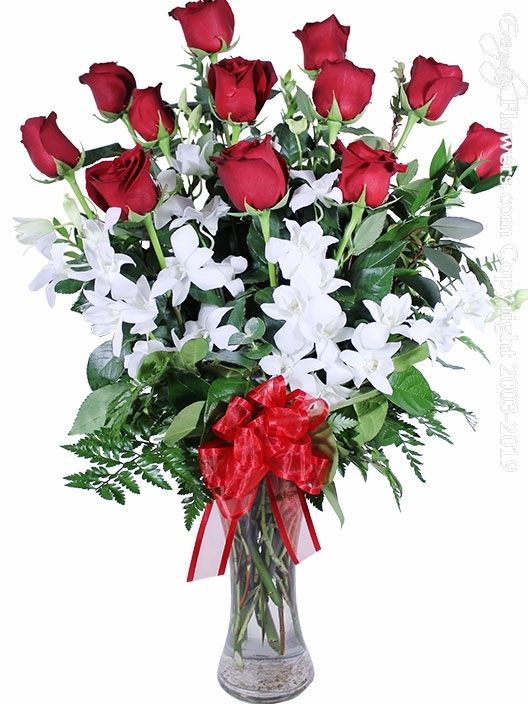 This rose arrangement uses 12 of our long stem red Ecuadorian roses and white orchids enhancing your rose arrangement. Arranged in a hour glass shaped glass vase with assorted greens and a hand tied ribbon. Everyday Flowers will always stand behind every rose arrangement that we delivery and if you experience any problems with our rose arrangements please let us know so that we can address the problem quickly. Also be sure to check out our rose care tips section to help increase the life of your rose arrangement.